Construction of Integration Formulas for Initial Value Problems provides practice-oriented insights into the numerical integration of initial value problems for ordinary differential equations. It describes a number of integration techniques, including single-step methods such as Taylor methods, Runge-Kutta methods, and generalized Runge-Kutta methods. It also looks at multistep methods and stability polynomials. 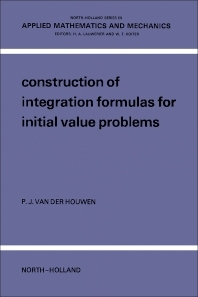 Comprised of four chapters, this volume begins with an overview of definitions of important concepts and theorems that are relevant to the construction of numerical integration methods for initial value problems. It then turns to a discussion of how to convert two-point and initial boundary value problems for partial differential equations into initial value problems for ordinary differential equations. The reader is also introduced to stiff differential equations, partial differential equations, matrix theory and functional analysis, and non-linear equations. The order of approximation of the single-step methods to the differential equation is considered, along with the convergence of a consistent single-step method. There is an explanation on how to construct integration formulas with adaptive stability functions and how to derive the most important stability polynomials. Finally, the book examines the consistency, convergence, and stability conditions for multistep methods. This book is a valuable resource for anyone who is acquainted with introductory calculus, linear algebra, and functional analysis.